This is a useful filter for a simple distortion meter for use with communications equipment where distortion levels of 1 - 10% need to be measured. A 60dB minimum depth notch may be obtained with adequate screening. For HiFi applications a much deeper notch will be required but that is outside the scope of this application. As shown the tuning mechanism uses a dual gang variable resistor but the capacitors could be made variable instead. The latter will require very high value resistors at R3 and R4 to tune down to 300Hz or less. The tuning and balance points are extremely sharp so a small dual gang variable resistor, say 2K5, may be wired in series with R3a/b to act as a fine tune control with a suitable adjustment in the values of R4 and R5 to obtain the desired frequency coverage. As shown the tuning range will be 10:1. However, if a lesser range is required, say 3.2:1 then R4 and R5 may be increased in value - this will require two ranges to cover 10:1 overall but will make the tuning less critical. All fixed tuning components and the emitter and collector resistors should be high stability 1% or better. R2 may be Cermet and R3a/b a precision wirewound dual gang potentiometer as tracking of both sections is important. Depending on the signal levels involved, operation on a supply of greater than 12V will provide lower distortion in the phase splitter. Good screening of all circuits will be required and the supply should be well regulated and hum free. C2 = C3 = 1800pF will provide a tuning range of approximately 1.55-18.5Khz with the other values shown and prototype component tolerances of 5% - in the final unit the tuning and balance components will be 1% tolerance. For improved ease of adjustment a fine tuning control could be included or the tuning range reduced from 10:1 to 3.162:1 by increasing R4 and R5 or decreasing R3 although this would require more switched ranges. This is the basic circuit with additional gain and negative feedback provided in order to ensure that the width of any part of the notch does not significantly affect the individual harmonics of the signal being measured. The minimum LF response will be determined by the value C1 and the notch tuning by the values of C2 and C3. R32 should have a tracking accuracy of 2% or better - the actual accuracy will determine the maximum value of the balance control resistor. 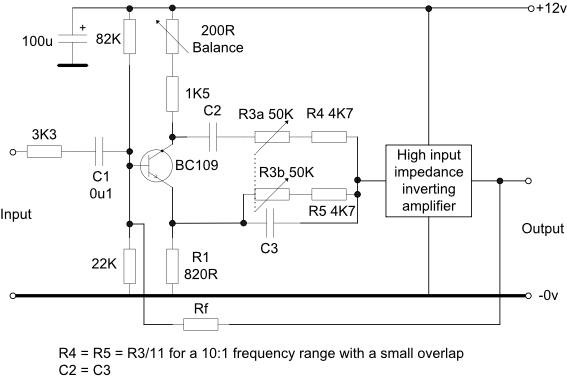 Using Amplifier 6 from this page for the inverting amplifier and setting Rf to 22K gives an overall gain of x5.4. To complete a basic distortion meter the linear detector from this page and a calibrated stepped attenuator are required.